Commencing at the junction of secondary road 524 and highway 36 near Vauxhall; thence westerly along secondary road 524 to secondary road 864; thence southerly along secondary road 864 to secondary road 521; thence westerly along secondary road 521 to highway 25; thence northerly along highway 25 to the junction of secondary road 526; thence continuing northerly on the oiled surface road also know as range road 19‑2 to the C.P.R. right‑of‑way; thence northwesterly along the C.P.R. 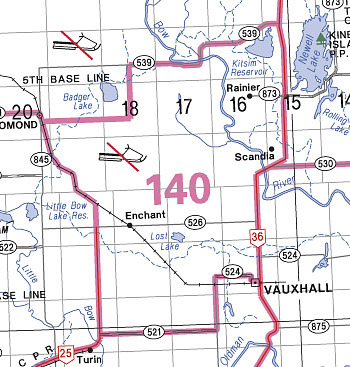 right‑of‑way to township road 16‑2; thence easterly along township road 16‑2 to range road 18‑3; thence northerly along range road 18‑3 to secondary road 539; thence easterly along secondary road 539 to highway 36; thence southerly along highway 36 to the point of commencement.